Cooking up a feast at the Festival. 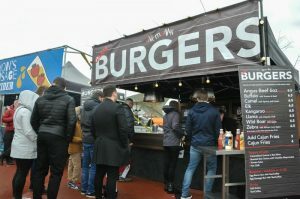 The Chester Food Drink & Lifestyle Festival, sponsored by Taste Cheshire, took place over Easter at Chester Racecourse for the 18th year in 2018 and the event saw more people cooking and being involved in cooking than ever before. It is anticipated that 2019 will see even more wanting to take part and enjoy fabulous cooking with such wonderful chefs. 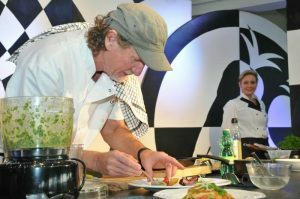 One of the event highlights is the many cooking classes and demonstrations, with all the various classes and demonstrations full for every session. Festival Organiser Briony Wilson was pleased with the response and is looking forward to seeing even more people taking part in 2019. 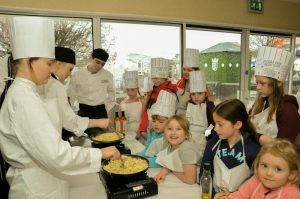 “In 2018 we had Adult cooking classes running all day with the Demonstration chefs of Harlech Foods and people loved those sessions with every session full. They learnt how to make burgers, and a variety of Asian dishes and create their own special flavours. They also got to eat what they cooked afterwards – a big bonus for all. We plan on running even more in 2019 and would advise all those attending to book on line to ensure they get a chance to take part. 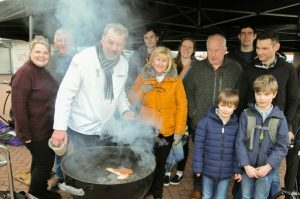 Brian Mellor of Harthill Cookery School taught just as many people how to master the Weber BBQ and his sessions were also oversubscribed with people raving about the BBQ flavours they created. Brian is again sharing his secrets on the BBQ in 2019. 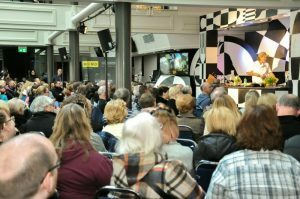 The Festival also ran free cooking demonstration seminars with the highlights being BBC’s Chris Bavin, ITVS’ Paul Rankin and Channel 4’s Jun Tanaka taking centre stage to packed audiences. 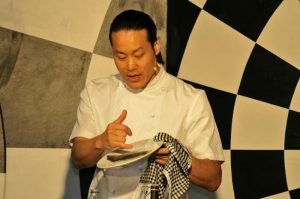 These were supported by local chefs who also played to packed crowds in the Auditorium. This years cast looks just as talented, featuring stars of BBC, ITV and Channel 4. 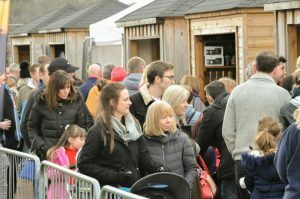 Over 150 food and drink Exhibitors took part with them all doing brisk business on the packed out and record Sunday with over 9,000 people coming through the doors on the only day the rain stayed away. The event featured foods from right across the planet. Little Somboon Kitchen provided the tastes and smells of Korea, Perfect Samosa the authentic flavours of India, Contrast Catering specialised in Japanese foods and Mukkaase foods had the subtle flavours of Africa, all in the Restaurant Garden but this was only scratching the surface of what has become the biggest event of its kind anywhere in the UK at Easter. The event wrapped up on the Wednesday after Easter with the Taste Cheshire Food and Drink Awards where over 40,000 votes were cast by customers who voted for their best Restaurant, pub, deli, sandwich bar, etc. 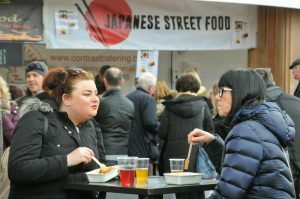 These awards having been running simultaneously with the Food Festival and are the industry bench mark across Cheshire. The event took place at The Pavilion at Chester Racecourse with over 350 of the industry attending on one of the few nights the sector gets together to let their hair down and crown the champions.